Whip up some football party recipes! There are numerous football party recipes that are sure to be fan favorites at your next get-together. 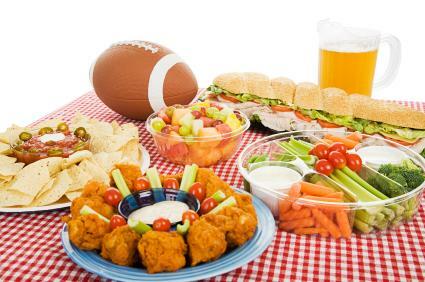 A football party is a great opportunity to get together with friends and family to cheer on your favorite team. It is also a great time to try out new recipes and serve an assortment of foods that will be enjoyed by all attending the party. Show off your culinary skills with a few easy recipes that will impress your guests and fill their stomachs. Try this twist on the classic sloppy joe. This recipe will serve 8 people. First brown the ground beef with the green pepper and onion. Add salt and pepper. Next, add the tomato sauce, diced tomatoes and ketchup. Add the remaining seasoning and simmer for 20 minutes on medium heat. Adjust seasoning to taste. Serve on Kaiser rolls and enjoy. This easy recipe is sure to please fans of all ages. Combine butter and onion and cook over medium heat, add ham and remaining ingredients. Cook for 10 minutes over low heat. Serve on sandwich buns. Be sure to mix well to combine all ingredients and refrigerate for at least 2 hours before serving. Who doesn't like dessert? Why not add a few tasty treats to your next football bash? Make it easy and buy pre-made sugar cookie dough. Cut football shapes and bake according to directions. Decorate as desired. You can also bake cookies and decorate them in your favorite team's colors. Cupcakes are simple to make. Just decorate them in your team's colors by adding sprinkles on top of the icing. Serve with plenty of ice and enjoy! Show off your team pride by serving your food on paper plates in your team's colors. Be festive with napkins to match and display a banner with your team's logo on it. Be sure to wear your team's shirt or jersey for support. Most importantly, remember to have fun and cheer on your team!